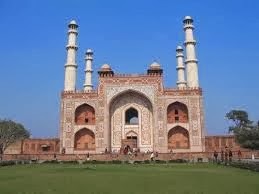 Sikandra : The city of Sikandra houses the tomb of Akbar. Legend has it that the construction and design of the tomb was started by Akbar himself, and subsequently completed by Jahangir. The tomb is made of five stories, the first four built of red sandstone and the fifth with marble. The tomb also has several well-maintained gardens.